Set on the sub-continent of Chult, the Tomb of Annihilation involves a lot of travel. Procedurally, there should be 3 random encounter checks—with a 25% of an encounter—each day of travel. As written, this procedure feels like its there to grind out level advancement. With almost complete recovery happening between every 3 checks (e.g. a Long Rest), resource management is at a minimum—bring out the big guns each and every time. In otherwords, travelling through Chult isn’t as dangerous as one might think (or hope), but it sure will take a lot of real time. In other words, travel is a bit boring. Players assign tasks and plan route. Loremaster determines Peril Rating of the journey. The Guide makes an Embarkation Roll: 1d12 modified by the Guide’s Survival proficiency bonus plus half their Wisdom bonus minus the Peril Rating. The Loremaster either relays the result, or optionally hints at it. Determine the number of Journey Events. Events are played through, noting down the result for reference. The Arrival roll (d8) is made, and results are applied. Key to the system is the idea of planning the trip. Players pick a point on the map to go to, and from there a few rolls are made to set the tone for the journey. Important to note, Long Rests are not available while journeying. You need to get to your destination before a Long Rest would possibly be available. First, let’s flesh out a journey from Port Nyanzaru to Fort Beluarian. Our group is a fighter, rogue, wizard, and cleric along with a hired guide. As a Loremaster, looking at the map, I’ll go with a Short trip (less than 150 miles) across Moderate terrain (company has some knowledge, broken terrain, scattered paths, and trails). This joureny has a Peril Rating of 2. The plan is to use boats. Using boats or pack animals allows party members to ignore the first level of exhaustion incurred while on the journey. We roll for Embarkation 1d12 + 2 for proficiency + 1 for half wisdom - 2 for Peril Rating and get a 10; +1 to rolls on the Journey Event Table, and the first roll for each Journey Event is made with advantage. As Loremaster, I secretly roll up the number of encounters. For a short journey across moderate terrain, I use a d2. I rolled a 2. I don’t tell the players how many encounters there will be on this journey. After all, I don’t want to tip my hat as to how they should spend resources. For the Journey Events, I establish the base DC of all checks at 14 (Base of 12 + the Peril Rating). I’ll roll twice on the Journey Events table. I rolled a 3 (2 on the die + 1 for the modifier) and a 5 (4 on the die + 1 for the modifier). Fallen trees, a fast flowing river, a rockslide, or a fallen bridge block the path ahead. The company must work together to clear the path. The Guide must make a Wisdom (Survival) ability check and each of the other company members must make their choice of Wisdom (Survival) or Strength (Athletics) ability check. If the company has horses or ponies, one of the company must instead make a Wisdom (Animal Handling) check. All of these checks are subject to disadvantage/advantage if the Guide’s Embarkation roll was either 4 or 9. If all of the checks are successful, the company has worked well together, clearing the route and feeling a sense of satisfaction from their unity. As a result the Guide’s Arrival roll will benefit from a +1 modifier. If half or more of the checks are successful, the route is cleared with some difficulty and no bonus or penalty is incurred. If less than half of the rolls are successful, but not all fail, the company has struggled to overcome the obstacle and each of them gains a [level] of exhaustion. If all the rolls fail, the company is forced to backtrack to bypass the obstacle. Each of them suffers a level of exhaustion and the Guide’s Arrival roll is subject to a -1 penalty. End result, the company cleared the route without any major setback. Hostile scouts or hunters cross the company’s path, this may even be a sharp eyed Crebain, gathering news for the enemy. The Look-out must make a Wisdom (Perception) check to spot the enemy before they become aware of the company. If successful, the company has seized the initiative and may decide how to proceed. They may either sneak past the hostile force or ambush them, in which case they benefit from a round of surprise. If the Look-Out’s Perception roll fails, the hostile scouts set an ambush and they benefit from a round of surprise. If combat ensues, the Loremaster may resolve it as normal, setting out the combat abilities of the small enemy party to give a small to moderate challenge to the company. All rolls made outside of combat during this task are subject to disadvantage/advantage if the Guide’s Emarkation roll was either a 3 or a 10. The company can choose, do they avoid the Flaming Fist entourage or do they lay out an ambush? As the Journey Event was Agent of the Enemy, I’d definitely predispose the encounter towards hostilaty. Sure they could try and talk, but really their itching for a fight. They choose to avoid the Flaming Fist entourage. They are beset by foul moods and short tempers that they must work hard to throw off. Each has disadvantage on all ability checks pertaining to social interaction, until such time as they succeed in one of these rolls. This penalty will apply if they seek an Audience at the destination. If there is a single upside to this dark mood, it is that they are so spoiling for a fight that each member of the company receives advantage to their Initiative rolls until they take a short rest. The Arrival also assumes you’ll be requesting an audience with whomever is in charge. The procedures from Adventures in Middle-Earth echo 4th Edition’s skill challenges. The procedures provide a framework to make travel interesting and meaningful. That same journey from Port Nyanzaru to Fort Beluarian would’ve required around 18 random encounter rolls, and allowed for long-rests in-between. 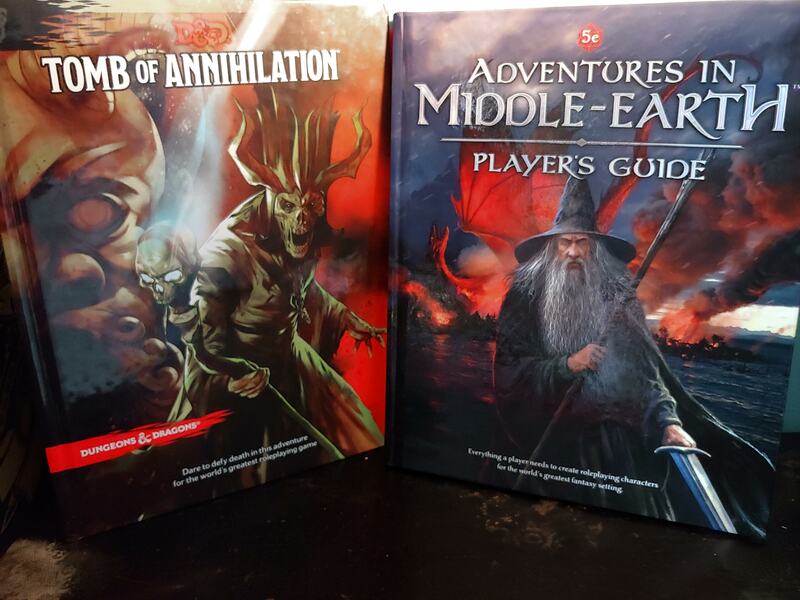 The overlap between Adventures in Middle-Earth’s journey procedures and Tomb of Annihilation’s exploration and random encounters is not quite seemless. However, having used the random encounter process in Tomb of Annihilation and Out of the Abyss, I’m ready to explore an alternate approach.